Hi, I updated Synfire Pro 1.8.5 , Afterthat Cubase Transport Panel and Synfire Pro External Synchorization is problem for me. Synfire Pro couldn't achieve to syncnorise with Cubase 9.5 pro. Can You Help me anyone? Thanks a lot. Thanks for answer. But I tried your answer. Unfortunetly not solution for me. I think my problem is cubase 9.5 and synfire 1.8.5 sychnorization. Could you solve the issue in the meanwhile? As explained in another thread, Cubase 9.0 works fine and so should 9.5, since ReWire didn't really change over the past 10 years. It is most likely that, as was the case with Logic X, Steinberg just changed the way ReWire is activated. Please check the Cubase manual or documentation for ReWire setup. Also note that Synfire's "Transport" acts as an instrument (slave). I had done as you said. I looked at cubase 9.5 manual. There is no extra information in order to solve this problem. There is a studio window on cubase. When I open the studio window also There is a rewire part. When I look rewire part I saw Transport panel as a rewire. I checked a mark. But That's all. There is no information any more. Can you help me? Why Steinberg change rewire? Also I don't understand. Thanks a lot. I have the same problem. Nobody can say what is the problem. Please also try other ReWire instruments (Transport acts like an instrument). If you get them to work, the issue is indeed with Transport and Cubase 9.5. If you don't get them to work either, then Cubase 9.5 has introduced a ReWire problem, or changed/obscured something with its setup. Oh, and make sure you have Synfire's 64 bit Audio Engine installed. Cubase might require 64 Bit ReWire instruments. Thanks Andre. I look at synfire. It is 64 bit version . I tried melodyne. Cubase saw Melodyne as a rewire. And audio input also activated. But Transport channel no answer as a rewire. I also upgrade cubase. There is no change anymore. I also checked cubase forum maybe I find a solution. But unfortunetly I couldn’t find a solution yet. In Cubase, go to the main menu and call Studio >> ReWire >> Transport. The small window opens as shown in the image below. 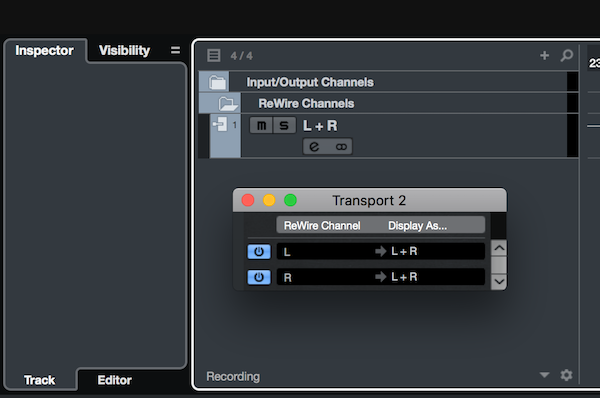 Turn on the ReWire audio channels of Transport. That will enable Transport for the Cubase project. You might need to do a Playback >> Reset in Synfire (or restart Synfire) for the change to take effect. Hi Andre. Thanks. But The most important problem is not enable audio channel. I don't know why. Maybe Problem is only for my mac. But I did as you said. But No Rewire audio channel will enable. Thanks alot again. High Sierra and cubase 9.5.20 is my system. Hi Andre. Would you take a short video about cubase 9.5 and synfire rewire used. And also cubase adjusment as a rewire. Thanks a lot. Because I did all as you said. There is no audio transport channel on cubase as a rewire. Thanks again. Am I also running into the same issue Cubase 9.5.21? When using Reason rewire to sync with Cubase 9.5, the features are spot on yet in Synfire Pro, the Transport Rewire Sync says "No DAW with a Transport found"? Going to [Studio-Rewire-Transport Rewire] in Cubase 9.5 does nothing except show and hide the lower Transport Panel. Picture Attached. 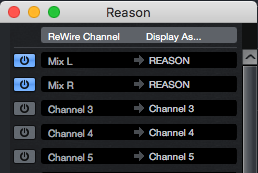 Going to [Studio-Rewire- Reason Rewire] shows the rewire channel (mix L / Mix R) menu. Picture Attached. This is a different display to the Rewire menu that you've shown in your screenshot as your's is marked with Transport at the top. I'm going to find out why this is happening and contact Steinberg as I'm burned out trying to figure this out. Will let you know my findings once I hear back from them. Just updated from Cubase 9.5 to 9.5.21 and can confirm that what worked fine with 9.5 does no longer work with 9.5.21. WTF. Whatever that latest Cubase update did change, it broke the ReWire panel, which does no longer show up. Since the user interface for ReWire setup changed too (in a maintenance update), I suspect there is some bug fixing still in the works with ReWire and Cubase. The mere fact a ReWire module is named "Transport" broke things in Cubase update 9.5.21. This now brings up the internal transport controls instead of opening the small ReWire setup window. Looks like menu actions are mapped by strings and hence this naming conflict arises. This kind of side effect should never happen, regardless how a ReWire instrument is named. So this is defintely a bug with the latest Cubase update. Please open a ticket with their support and let them know the above (copy/paste). The more Cubase users do that, the more likely it will get fixed. Has anyone filed a bug report with Steinberg yet? The more, the better. Yes Andre. I send Steinberg a mail as you said before. They said that "
and will be reviewed by our support staff as soon as possible - usually within a few working days. and the complexity of your inquiry. If you want to add additional comments to your original request, please reply to this email." As a very last resort, if Steinberg does not fix it, we could still rename "Transport" so something else, e.g. "Synfire Transport". But I am reluctant to doing that, because it is not immediately clear what such a renaming might break. Probably the saved DAW projects of our users might no longer load properly. Who knows what else. It should be a simple fix for Steinberg, so let's wait and see. Thanks Andre for great support. The Steinberg forum has a thread that looks similar, so I posted Andre's comment on there as well. Although I confirm there is an issue on the Cubase side, I would advocate the idea of renaming Synfire ReWire device "Transport" to something less generic. All other software I know of (e.g. Celemony Melodyne, Plogue Bidule) use (a part of) their product name as their ReWire device name. So I think "Synfire Transport" would be much better. The bug was posted again on Steinberg's user forum (subject line: "Potential Security Vulnerability w/ReWire Menu"). It might help if you add your own comments, so it gets more attention. Has anything changed with Cubase lately? Is this still an issue? If so, I've given up on attempts to get heard by Steinberg. We might consider renaming the Transport device with the next update, even if that risks breaking a few saved racks. I have just verified this issue with the latest Cubase Pro 9.5.41 and, unfortunately, nothing changed whatsoever. The symptoms described above are completely the same as they were in Cubase 9.5.21. Sorry for not bringing better news. Ok, then we will rename that ReWire device to Tranceport, Tranxport, Tranzport, Transfart or something. Needless to say how ridiculous this is. I suppose that "Synfire Transport" should be okay but if you are unsure then "Synfire ReWire" would be the most standard way of naming ReWire devices. Did anyone try Cubase 10 already? Is the bug still there? Hi, i don't have tried cubase 10 but if you can rename transport to something else it will make things just work ! please :) !